There are times when you feel that certain elements of your video need to be focused on. You might want to include the precious moments captured in your collection of photographs. The creative genius in you wants motion that your camera didn't capture. You can do all this and much more with the Pan and Zoom effect (also known famously as the Ken Burns effect) in Video Edit Magic. That priceless expression on a person's face can be highlighted by zooming in. You can creatively pan across one end of the photo to the other and produce movement in the otherwise lifeless image. Moving back and forth to focus on details within the same image becomes a reality when you work with this effect. Breathe Life to Images: That amazing collection of photos you have could enrich your video. Simply use this effect to pan from one side of the picture to another (or from the top to the bottom), creating an illusion of movement. Avoid Jarring the Viewer: While it is nice to supplement video with images that add to the overall story, a sudden jump from video that has motion to still photos can startle your viewers. Pan across snaps to create an illusion of continuous movement. 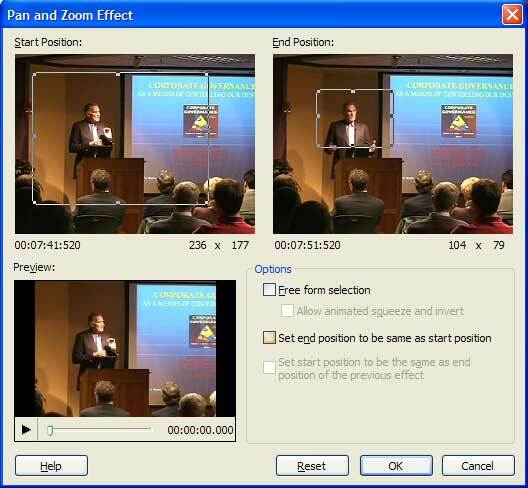 Highlight an Element: You can simply zoom in on the person or section of the video that you want to emphasize. The point of view gradually moves toward to the target, providing the viewer a closer look at a crucial component of your visual composition. Enhancing Video Motion: If the camera panned during filming, but you would like a more sweeping movement in your final video, use Pan and Zoom to sweep across the width of the video frame while the camera is also panning. This can produce a truly dramatic feeling of fast movement. This technique lets you focus on important elements in the image, while simultaneously showing the entire setting. In the File menu, click Open File. Browse to the image file you want to work with and click the Open button. The file is added to the Collections window. Double-click the name of the file to add it to the selected video track in Timeline or drag and drop to a video track. Select the Effect track to which you wish to add this effect and move the Selection Slider to the time when you want the effect to start. Select the Pan and Zoom from the Effects tab in the Collections window. Double-click to add it to the selected Effect track. Select the options you desire for the effect and click OK.
To preview the video after this effect is added, click the Play button on the Preview window. Now let us take a look at how to actually work with this effect and the marvelous difference it makes to your videos. Consider this family photo. You can use the Pan and Zoom effect to focus on the face of every member briefly, one after the other. To do so, go to Effect Settings. First reposition and resize the Start Position rectangle to include the face of the person present on one end of the frame (the grandfather in this particular example). Now, reposition and resize the End Position rectangle so it includes the face of the person sitting at the other end (the grandmother). When you play the video with this effect added to it, a panning movement will be carried out, from the start position rectangle to the end position rectangle. As the movement occurs, the focus will shift from the grandfather to the grandmother and will include the couple sitting in between as their faces lie in the path of the two rectangles. You also have the option to Set end position to be the same as start position. This makes the size and location of the End Position rectangle same as that of the Start Position. Since the start and end positions are the same, this produces a pure zoom effect. The video is zoomed to a particular point, and the zoom remains the same through the duration of the effect. This option is available when you are using more than one Pan and Zoom effect on the Timeline. When you select this option, the Start Position of that effect will be same as the end position of the previous Pan and Zoom effect on the Timeline. This helps maintain continuity while carrying out complex sweeping movements where you use multiple panning and zooming effects. Consider the example given below. In the first effect, the camera pans from the piano and zooms in to finally focus on the sofa. Now, if you want to maintain continuity in the panning movement, add another Pan and Zoom effect and select the option Set start position to be the same as end position of the previous effect. The Start Position rectangle automatically positions itself in the same place that the last Pan and Zoom effect ended (in this case, the sofa) as you can see in the screenshot below. 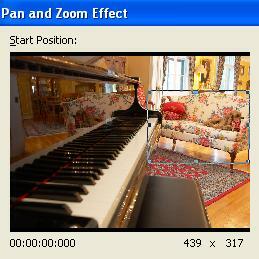 You can now pan away from the couch and to zoom on another spot in the room, for instance back to the piano. If you want to highlight a particular portion of your video, you can emphasize it by zooming in. To do so, double-click on the Start Position box so that the rectangle includes the full screen. Now move the End Position rectangle to the place you want to zoom in to (the building at the end of the path). When you play the video, the scene starts with the lake and woods being shown. The view gradually shifts and narrows to focus on the building. Now you can actually see the faade of the building as well as the car parked in front of it which was unnoticeable earlier. Talk about directing the viewer's attention! Another interesting option is Free form selection. This option allows you to specify the Start and End positions without maintaining the aspect ratio. Selecting this option gives you more creative freedom in terms of focusing and zooming on a particular region accurately. Care must be taken while working with this setting since it leads to exaggerated widening or lengthening of images and the edited video may appear distorted. By using various resizing and repositioning combinations, you can Pan and Zoom at the same time and also create other stunning effects. The speed of panning and zooming will depend upon the effect duration. You can change this duration by resizing the Pan and Zoom effect bar on the Timeline.